Our weekly Sustainability Spotlight is continuing into the summer with a little bit of a twist. The Office of Sustainability’s Podcast Intern Tanner Glaze and I are interviewing notable members in the community who are promoting sustainability and creating a cultural change within our community. For our first community member, we decided to keep it internal and sat down with Adrian Barry, who has been with the Office of Sustainability since its beginning and was instrumental in its creation. 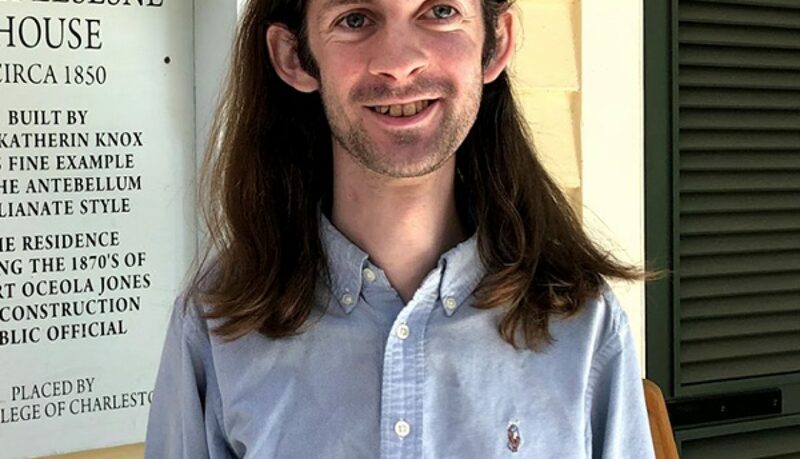 Being a man with many connections, Adrian currently serves as a community liaison within our office. We sat down with Adrian on Monday sipping black chai tea to ask all the important questions in regards to sustainability. Adrian grew up in Northern New Jersey in one of the more rural parts of the United States. His interest in the environment started early on as he spent most of his time outside while growing up. He spent time riding his family’s horse down one of the trails in his community, sometimes even to school, and refers to his mother as “a typical former hippie earth mother type” who was instrumental in building the foundation of his values and beliefs relating to sustainability. So how did Adrian find himself attending the College of Charleston? He was so intrigued by the college’s unique Cuba study abroad program that he transferred here. Inspired from the Cuba program and two classes he took within the Political Science department, Adrian and his roommate at the time created CofC for Urban Agriculture to mirror a similar program they learned about in Cuba. They reached out to create connections with other programs around campus such as Alliance for Planet Earth, Americans for Informed Democracy, South Carolina Student Legislature, SGA, the Political Science club… the list goes on! All clubs Adrian eventually joined. Where does the Office of Sustainability fit into all of this? There was a push to create a Green Fee. It would be a small supplemental fee that is paid each semester by the students and put towards green initiatives on campus. Once it was passed there was the question of who would be in charge of the fee distribution? 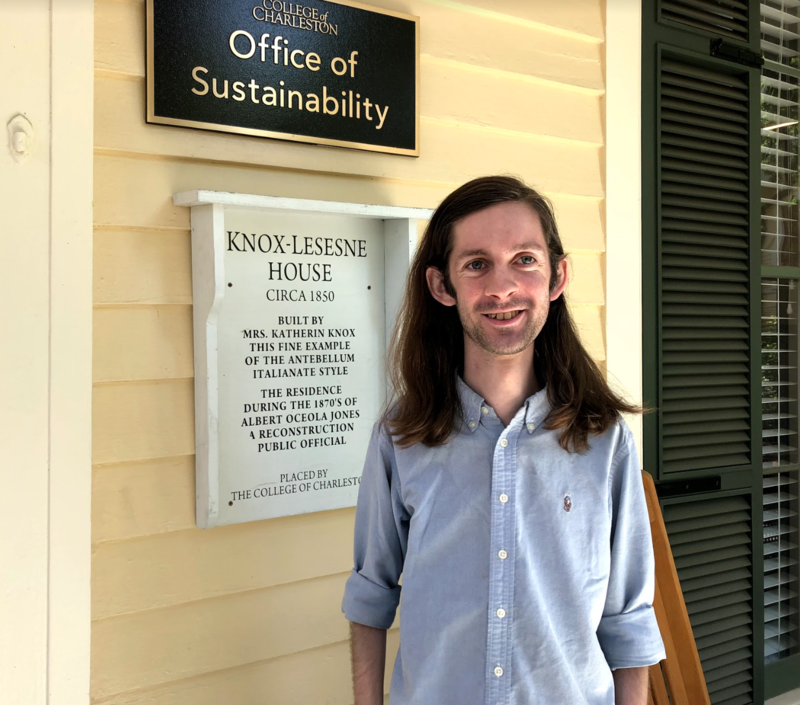 The candidates interviewed were all short of capable and the position was offered to Dr. Fisher, a political science professor at the College of Charleston known for his sustainability themed classes. Fisher is still our director of the office today! Within the hour of accepting the position as administrator of the Green Fee Fisher created the Office of Sustainability. From there the office was ready to start changing the culture of the campus. From the beginning the office has been structured and designed to be run by students with direction and guidance from a few staff members. It was really important to Dr. Fisher that students would have their voice heard and that they would be “a strong, vibrant student entity to push back against him” if he got something wrong. Fisher also felt it vital to still able to teach classes and remain in the academic side of the university, so as to not become completely absorbed into the administrative side of academia. Looking towards the future Adrian wants to see the office and the other programs and initiatives on campus work together and collaborate to create a more unified and cohesive effort toward the goal of sustainability. To conclude our interview with Adrian we asked him to define sustainability for us. “I think of sustainability as a lens to view the world, it’s not an entity, it’s not a defined thing, it’s kind of like a whole, cultural lifestyle thing. It finds its way into everything you do. It’s what you buy, what you eat, where you travel, what you wear, it’s everything.” And there you have it. Sustainability is everything. Visit Synergies Podcast page to listen to the full interview.